So you should already know that Taj- Anwar Jackson is the “Dopest Babies Mama” right! Well, she had an idea for a T-Shirt Design and asked me to design it. 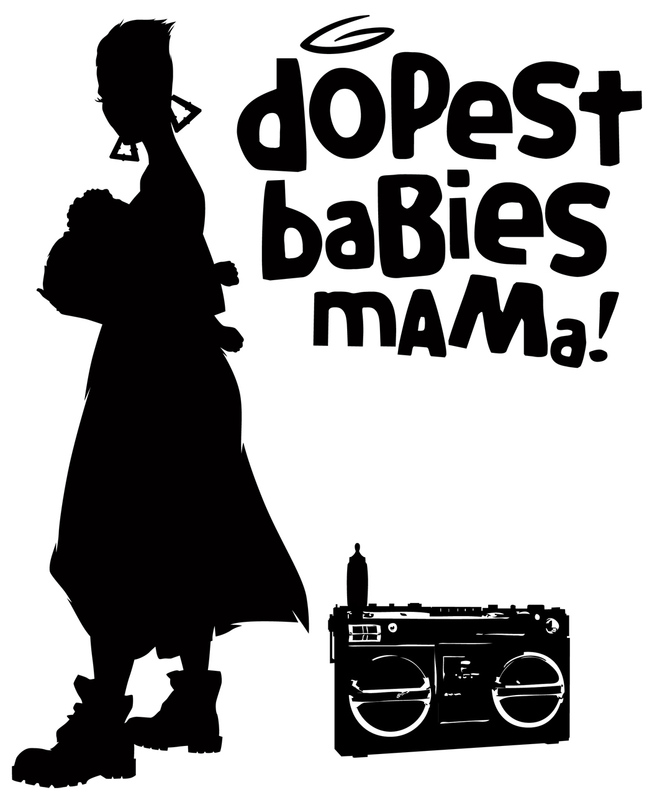 Of course her idea was on some revolutionary but gangsta ish with a mother nursing with her foot on a boombox. Or a pregnant women with her foot on the boombox with a child around the leg. That’s a strong image right there. I was laughing but I liked that joint! HAAAAAA! She still gave me room to play with the idea so it just so happens that Taj had just taken some pictures by the one and only T.T. Coles(who did a Fangtastic job btw), and I had my image. Got the rest of reference elements that I was going to use and got busy. completed the initial idea and did an extra one just to see how it looks. Shot it over to T-Shirt extraordinar Goldi Gold. Asked his opinion. He pointed me in the right direction and WHA-LAA… We arrived at this completed design. I dig it! Taj digs it! Goldi digs it! And now you will be able to judge fo yourself. Be on the look out though because they will be hitting the skreets sooner than you think. Taj gets it in and if you want to get your shirt you need to check www.dopestbabiesmama.com this Friday. Also you can get more info on Taj Anwar-Jackson check www.dopestbabiesmama.com. FANGGGGGGGGGGGGGGGGGG!!!!! !